Plots ranges from 1102 sqft to 1755 sqft. 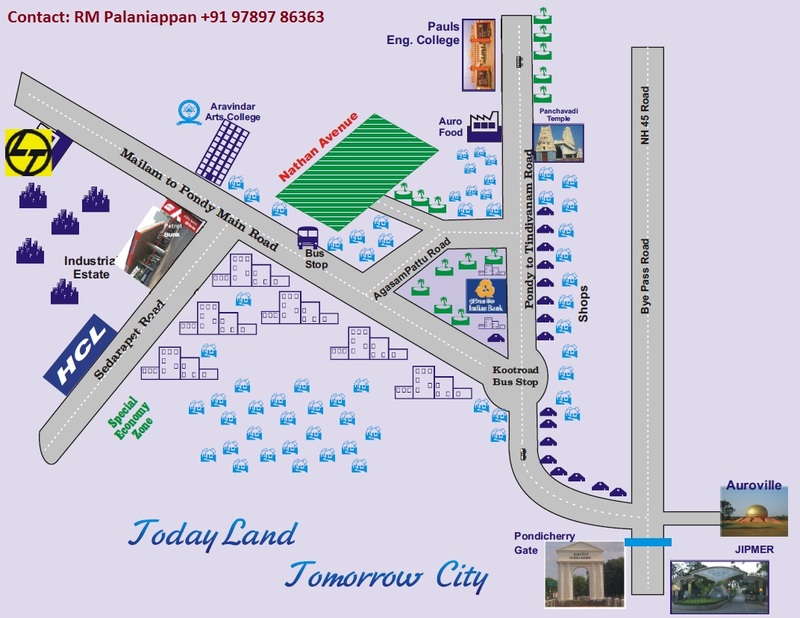 This property is situated in Pondichery to Thinidvanam Highway. 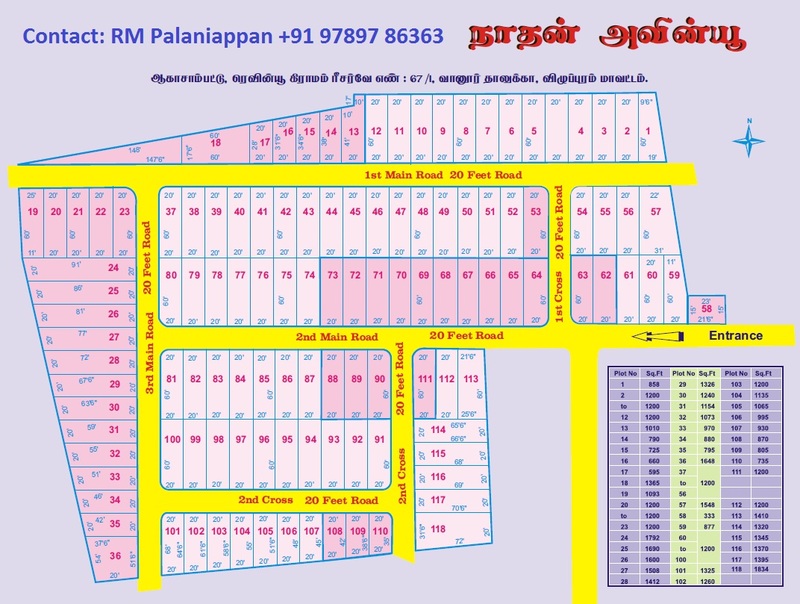 Land for Sale in Suriyur , Trichy - Suriyur Plots is situated at HAPP (OFT), just 5 kms from TIDAL Park.6kms from Pudukkottai Main Road.3 kms from Kumbakudi Village. Just 15 minutes travel to International Air port. 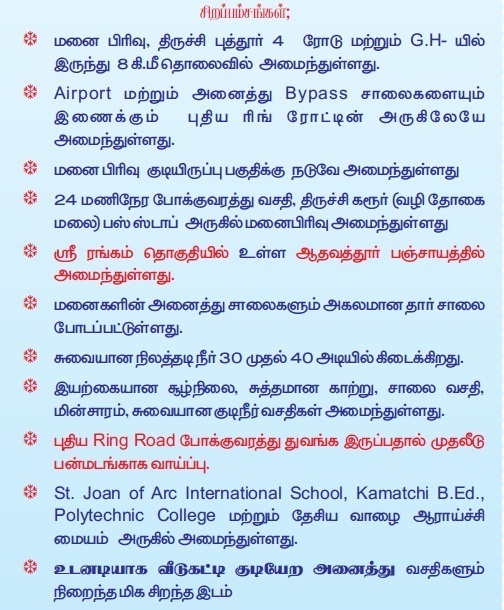 Just 20 minutes travel to Trichy Central Bus Stand. Good Drinking Water Source. 24 Hrs Transport facilities. Fast Developing Residential Area. Close to Village with Electricity and Telephone facility. Best for investment. 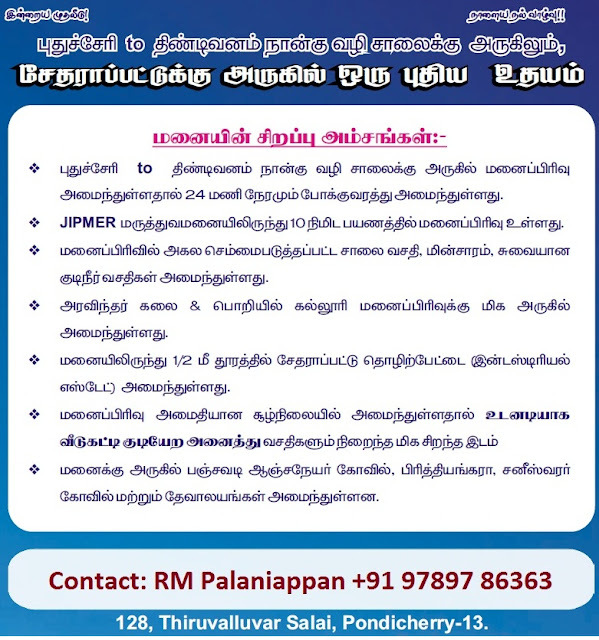 Best Investment Purpose in Srirangam , Trichy - Railway station and Bus facility available 24 Hours. 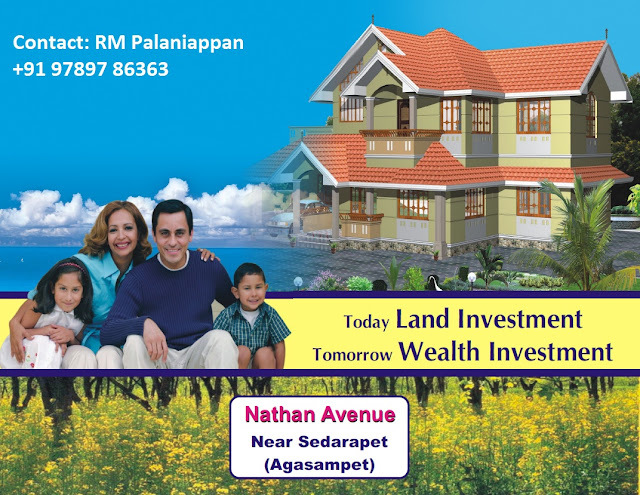 Plot adjacent to Cauvery river. All facilities are near by. 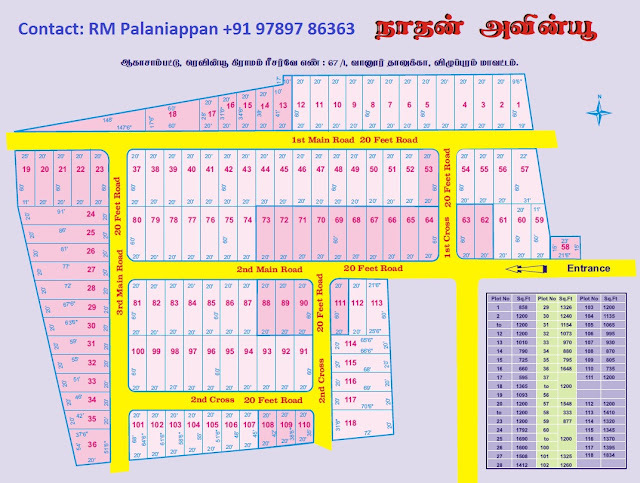 Residential Approved Plots in OFT , Trichy - LOW COST & VALUABLE FOR MONEY. 4 Kms from the ELCOT IT Park located in Navalpattu. Very close to Trichy-Pudukottai HW & 6 Kms from BHEL. 24 HOURS BUS FACILITIES. Immediately EB Line Connection. 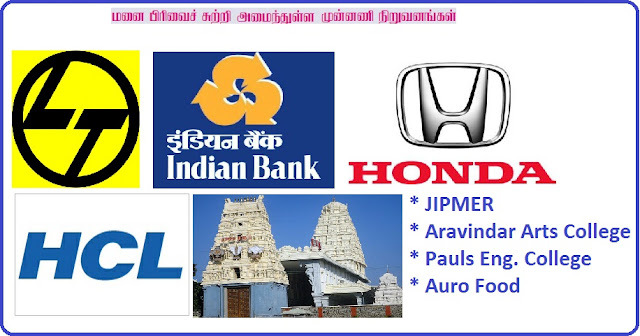 Viralimalai is just 30 kms from Trichy. Ready to built house. Layout is facing Trichy-Madurai national highway so plots highly appreciable. 1200 Sqft, Land for Sale in K K Nagar, Trichy - Very close to banks and shops. Quiet neighborhood. 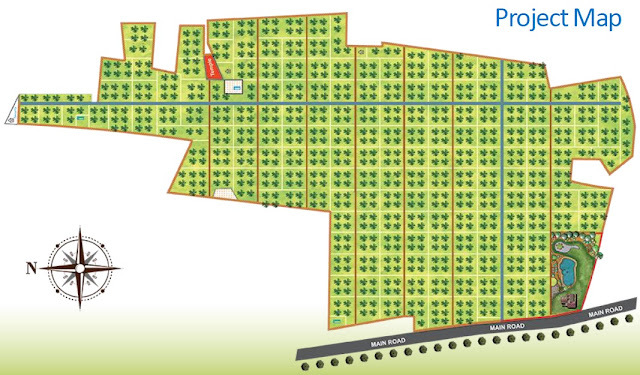 800 Spft,Approved Plots for Sale in Tiruvanaikoil, Trichy - Tiruvanaikoil is just 10 kms from Trichy City. 1500 Sqft, Best Investment Purpose in Samayapuram, Trichy - Samayapuram is situated on Tiruchirappalli Chennai NH 45, just 20 kms north of Tiruchirappalli town. 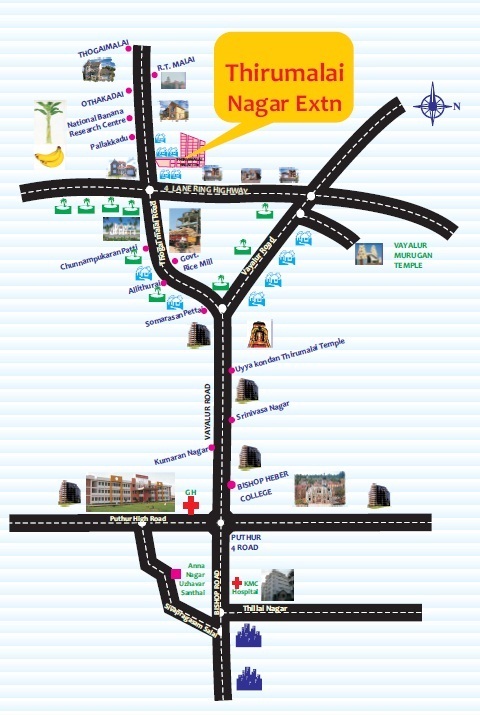 near Karumandapam, Trichy - Karumandapam is located at just 7 kms from Trichy City. 2400 Sqft, Premium Plots on Sale in Trichy at Affordable Cost near Woraiyur, Trichy - Woraiyur is located at just 7 kms from Trichy City. 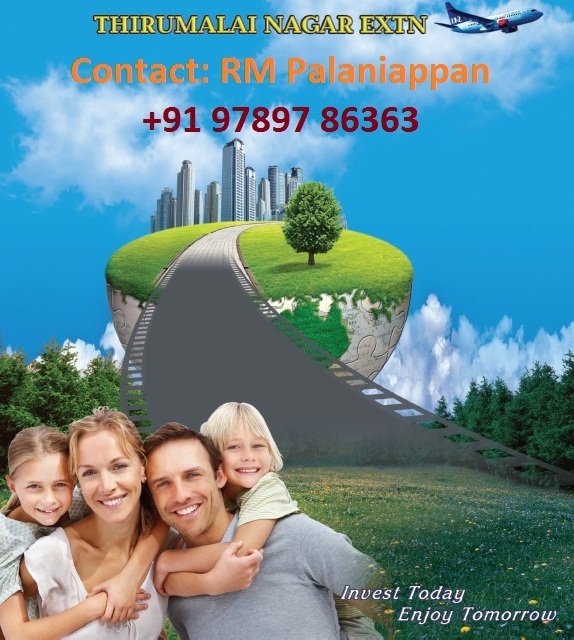 Vayaloor Highly appreciable villa plots are now available for sale - Trichy, Vayaloor Road, Corner plot, 2400 Sq.ft. Facing towards east and south. 30feet road. 60x40. Land has increased in value by over 800% over the last twenty years and remains one of the most popular forms of investment . Historically, buying land has been restricted to large development companies, farmers and wealthy individuals . A residential-sized plot of land would allow buyers to share in any future development gains without the need to buy large acres as a developer would.The simplicity and transparency of land investment has gained many followers. There are no complicated concepts that purchasers need to understand , just that there is an ever-increasing demand for land.Buying land is far simpler and quicker than buying property, although you would still be recommended to use a solicitor to protect your interests. In the contemporary times, more and more people are consulting a Vastu expert, while selecting a plot, irrespective of the fact whether they want to use the plot for residential or commercial purposes. Vastu for plot selection goes a long way in keeping away the negative energies, which lead to severe health and loss of money. Vaasthu advice for plot selection is based on the study of multiple factors, which include direction of the site, type of soil on the site, shape of the plot, surroundings of the plot and many more. Check out some vaastu tips for plot selection, in the following lines. Choose a plot that doesn't have an irregular shape. Square or rectangle shape plot is considered good. Make sure that the plot doesn't have any cracks. A plot that has more length in the east or west direction is good for purchasing purpose. As per vastu, buying of such a plot that has more of open space in southern portion as compared to the northern side is not suggested, as it is likely to cause some sort of destruction. It is advisable to buy a plot that has the main entrance in the mid-west or in the northern portion of the plot. It is not recommended to buy a plot facing the west direction. A plot-facing road from all sides is considered auspicious. People of different occupations are affected by certain directions chosen for plot. For instance, a plot facing east is considered favorable for scholars, philosophers, priests, teachers and professors. For people handling administration of a firm, selecting a plot facing north is good. Government employees can also choose a plot facing north. In case you are a business person, then purchase a plot that faces south. For the people providing services to the society, opting for a plot facing west is good. According to vaastu shasthra, fertile plot with greenery surrounding it is considered auspicious. Make sure that there is no graveyard or tomb in the front, back or adjacent to your plot. Avoid the plot that is located in the vicinity of schools, colleges or cinema theatre. Do not purchase a plot, to which rain water from the roof of the neighborhood falls. Make sure that there is not tall building located in the north eastern side of your plot, because it would ruin your mental peace. However, if the high-rise building is located in the south, south west or western side, you may purchase the plot. Avoid purchasing a plot with rivers or canal flowing on west or south side of the plot. Make sure that there is no pillar, electric or post nearby your plot. Investment in plot is one of the dif­fi­cult invest­ment deci­sions for any investor. The rea­son why it is con­sid­ered as dif­fi­cult owing to the amount of invest­ment required. Apart from huge money invest­ment, own­ing a plot has an emo­tional aspect. Hence you should be very care­ful and cau­tious before you pur­chase a plot. Whether the plot is non-agricultural(N/A) and has a clear title. Check whether the seller has a right over the property. Ver­ify whether the plan has been pre­pared accord­ing to the devel­op­ment con­trol rules. Check whether the details of approved plan have been dis­played at the site. Ensure that plan­ning per­mis­sion and build­ing approval has been obtained from City Devel­op­ment Cor­po­ra­tion from the local body concerned. It is always advis­able to hire a lawyer to ver­ify all the above points before you pur­chase a plot. But if you are tak­ing a bank loan for buy­ing plot, in that case the bank always does a due dili­gence and ver­i­fi­ca­tion before grant­ing a loan. This is always a bet­ter option as the ver­i­fi­ca­tion done by a bank is very robust and reli­able. You can still go ahead and ver­ify the doc­u­ments with a lawyer for your own confirmation. Organic Gold Farm is an Excellent Investment, Ongoing income, and Recreation and is an All in one excellent opportunity for you. Organic Gold Farm is an: One time investment and 2 life income. 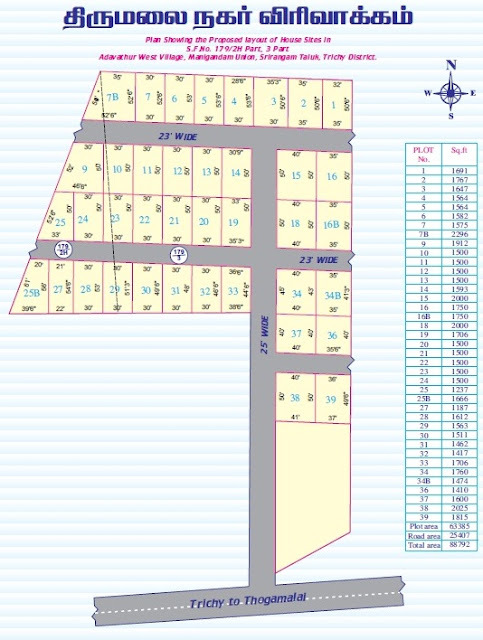 1200 S1ft Residential Plots for Sale near BHEL. Excellent location and great value property. 1545 S1ft Residential Plots for Sale near OFT. Great investment and good location. 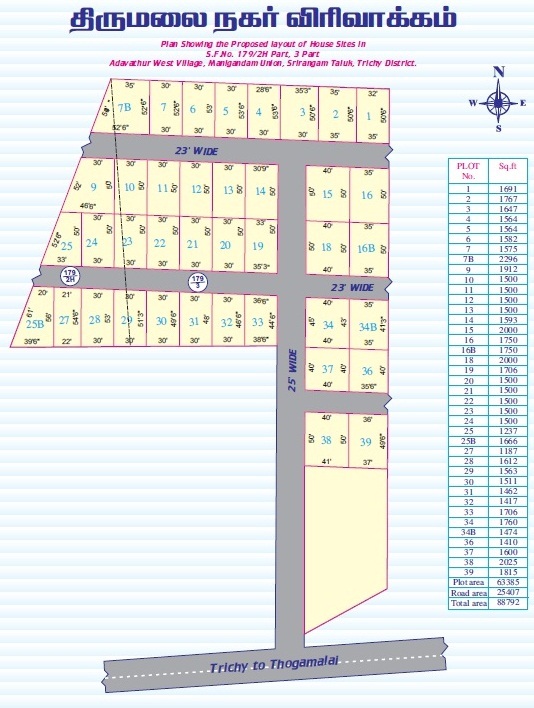 900 S1ft Residential Plots for Sale near HAPP. High return on investment value property. 1375 S1ft Residential Plots for Sale near Golden Rock Railway. Affordable price plots for sale. 2400 S1ft Residential Plots for Sale near Work Shop. Good for residentail purpose. Also, 20*40 sqft residential property is available for sale near Sri Ranganatha Swami Temple ( Srirangam). TrichyProperty.in is Trichy's No.1 property development services company, offering its customers the best advice and assistance in buying property in Trichy. TrichyPlots.com With over 20+ years of experience in the real estate sector, we are offering Residential Plots, Commercial Plots, Agriculture Land. We are a niche service provider in our domain and ensure that we cater to the diverse needs of our customers.